Simple Midwest Mom: Home Invasion! Living in the country has it's perks. The perks are not as noticeable however, when the weather turns chilly. This means we get all kinds of little "roommates" whether we like it or not. A few weeks I woke up to an awful scratching, clawing sound right outside my window. I kept banging on the wall and it would stop, for a minute, and then the persistent clawing continued until it eventually ceased. The next morning I'm guessing what ever "it" was the morning before, finally found a way in as I heard the horrid sound of sharp nails on metal from our heat and air vents in our crawl space. Then, this week we've had 3 mice that we know of, all of which we've caught. We're not mice lovers by any means (Ohhh, trust me on this one!) but our son begged us not to hurt the poor creatures. So... for some unknown reason we thought it a good idea to just toss the mouse out in the front yard! We've probably been chasing the same stinkin mouse all week! I think his time was up tonight though if it's the same one. Yep, Mr. Frisker's chased the mouse under the sofa, my husband tipped over the sofa so he could shew the mouse out, but he wasn't there. We looked everywhere in the living room and started to give up. Hubby lowered the couch back down and there it was... one small crushed mouse. Eeewww, nasty! I think I need to go sanitize my sofa cushions now. Oh I can't wait until the little vermin hibernate, so bring on the cold weather! Wait, DO mice hibernate? I can't stand those furry little things! I gave you an award, stop by my blog to pick it up! We are having the same problem, they're upstairs in our attic. We put lots of poison up there last weekend and I haven't heard any scratching since. We are working on our unfinished bonus room up there this weekend so I hope they're all dead, otherwise they might try to come down to the main floor with the wide open. Only problem with the poison is we may find some stinky dead mice up there, yuck. I know how you feel, dealing with the same thing here, I hate opening a kitchen cabinet to find little turds left behind. We however are not so nice when catching them. You'd think with two house cats this wouldn't be an issue...they are just too lazy. Hope you have a great weekend with NO mice! Everytime winter comes, the mice come in our house too! It's hard to get rid of them. 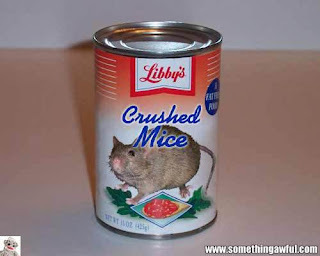 Love the can of crushed mice. That is so funny. Umm, Ewww! For us it's spiders. I HATE spiders. I had a lovely experience with one that I blogged about. I believe it's under Just for Laughs category lol. I hope you get it under control. I'm tagging you to share 6 random facts about yourself. If you feel like sharing just go to my blog where you can read my random musings and copy and paste the rules. Guess what? I've tagged you over at my blog. I hope you come see and if you do it please let me know so I can be sure to read it okay? OK, I feel really silly! I've been visiting your blog via my blog dashboard (when you posted the award post) and thinking to myself "...hmmm, no new post yet, I hope nothing is wrong..."
DUH! My dashboard takes me right to THAT post and not to your newest post - I feel like such a doofus! I'll be back now that I "remember" how!!! I'm new to your blog and the first thing I read is on a topic that can make me climb tables (smile)! O, I have many times in my life time. If I had time I'd share a story that happened many years ago that I'm sure my husband would want to forget. He probably can still hear my shrieking screams! YIKES!! UGH!! OH!! I used to say, "I'll chase the devil down but I will run from a rodent!" UGH!! Blame it on the fact that I am not a country girl although I think country living is beautiful but I was born and raised in NY and also lived in NJ so my more southern roots is 10 yrs spent in Virginia and now 2 years in Florida. I still can never get used to anything with more than two feet except my two dogs, one cat and our turtle. Love your blog and your midwestern style. I'll definitely be a new reader. God bless you.